Quran Link is the world’s first cross-device Quran study app and it has everything you need to understand and study the Quran. 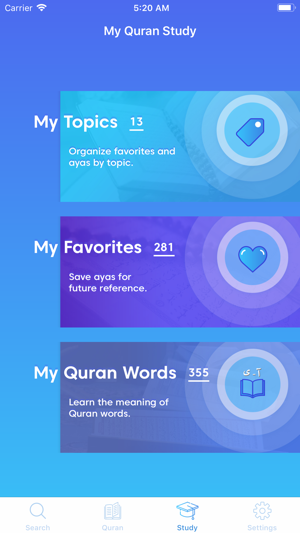 No more feeling lost and consuming lots of time searching for trusted resources to understand the Quran words/ayas, and creating a link between them. 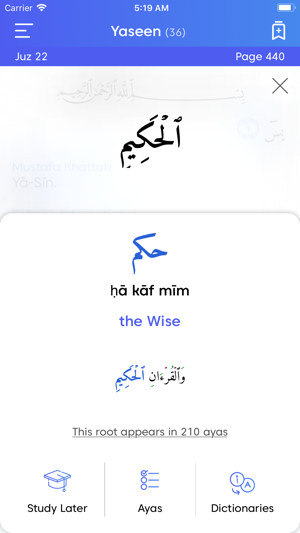 With the first of its kind Quran tafsir cross-device feature your bookmarks, favorites, notes, selected tafsirs and translation, simply all settings will be there for you on every device you use; from iPhone to iPad to the web. You deserve it! Multiple dictionaries (ex: Lane’s Lexicon, Mukhtar Al Sehah, and Gharib Al Quran) and many tafsirs, all in one place with just a tap on the word or the aya. Easily choosing your preferred translation(s) and switching them on/off as you read the Quran. Fun dynamic ways to make connections between different verses using videos, links and rich typography. تعمق فى تَدَبُّر القرآن وفهمِه، أحصل على المعانى المتعددة لكل كلمة بضغطة واحدة، إفهم التفاسير المختلفة للآيات والعلاقة بينها - فى مكان واحد فقط بطرف إصبعك من خلال تطبيق تفسير القرآن الأول من نوعه العابر للأجهزة. قرآن لينك لديه كل ما تحتاجه فى رحلتك لدراسة وفهم القرآن. هو التطبيق الأول من نوعة فى العالم الذى يمكن إستخدامه عبر أجهزتك المختلفة (ايفون، ايباد، لابتوب، "وباقى الأجهزة قريباً") للوصول لتفاسير آياتك المفضلة التى قمت بحفظها وملاحظاتك المختلفة من أى مكان. لا مزيد من اليأس من عدم الوصول لمصادر موثوق منها تساعدك على فهم معانى الآيات المختلفة فى رحلتك لدراسة القرآن. فأنت تستحق السرعة والدقة فى الأداء. تفاسير آياتك المفضلة التى حفظتها وملاحظاتك تصاحبك عبر جميع أجهزتك. عدة قواميس وكتب تفسير - كلها فى مكان واحد على بُعد ضغطة واحدة فقط على الكلمة التى تريد فهمها. سهولة إختيار الترجمة المفضلة إليك وتفعيلها أو إيقافها عند ٍقراءة القرآن. طرق تفاعلية وممتعة فى ربط العلاقات بين الآيات المختلفة بإستخدام الفيديو، الروابط المختلفة وخطوط أحرف ديناميكية. كن منظماً من خلال خاصية “Topic Tags” للوصول لملاحظاتك ومواضيعك المفضلة التى تريد إستكشافها. 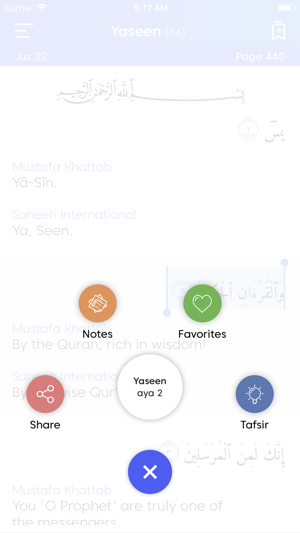 New Quran Study tab collects all your Favorites, Topics and Quran Words to help you study the Quran. New Quran text with stop marks. New The Clear Quran translation by Dr. Mustafa Khattab. One-tap find word meaning and all occurrences of the word in the Quran. Completely redesigned UI. Some bug fixes. 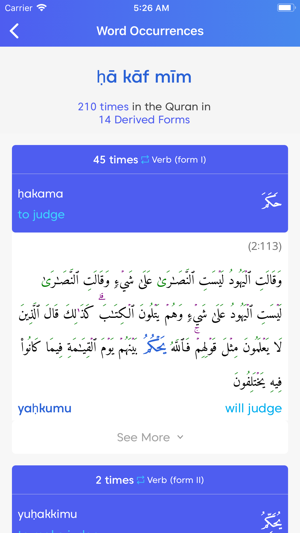 This Quran app is really good source of our Quran learning and understanding. It has a night mode, page and ayah bookmarks, sharing and tafseer options, show Quran translations while reading and other features. 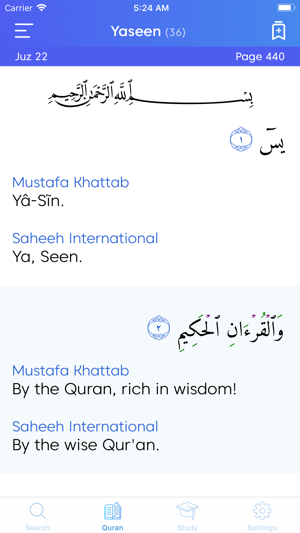 Multiple dictionaries are useful for understanding the meaning of a word in the Quran. 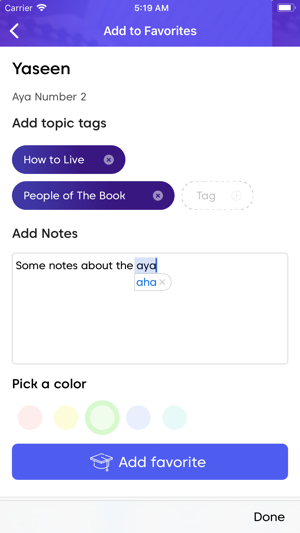 Saving ayas by topic is my favorite feature. 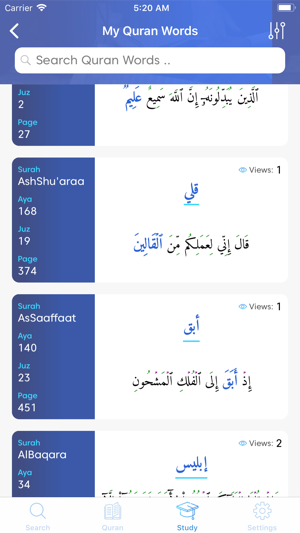 This is one of the best Quran Apps out there! It’s very easy to navigate and is very useful!